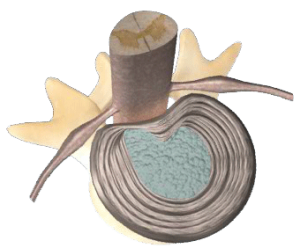 A herniated disc occurs when an aging disc degenerates and the supporting outer radial fibers of the disc, called the annulus fibrosus tear, and gelatinous material from the inner core, called the nucleus, bulges or leaks through these annular defects, resulting in varying degrees of disc material protruding and often compressing on the spinal nerves, resulting in spinal cord compression or nerve root compression. Usually patients present with severe, acute, sharp pain that may initially start in the low back or neck and then followed by radiating arm or leg pain. The pain is often described as intense or severe. Women actually compare radiating nerve pain secondary to a herniated disc as being as bad or worse than labor pains. There may be an audible or mechanical sensation when the tears of the annulus fibrosus actually occur. Patients complain of back pain or neck pain that may radiate into their legs and arms. They typically have pain with terminal ranges of motion in flexion or extension. They may take on a peculiar postures such as bending forward or to the side. Physical examination of patients with a herniated disc often reveals decreased range of motion in that spinal region as well as nerve root symptoms that are exacerbated with stretch, such as sciatic pain worsened with a straight leg raising test or patient’s radiating arm pain secondary to a cervical disc herniation worsen with mechanical nerve testing or stretch. 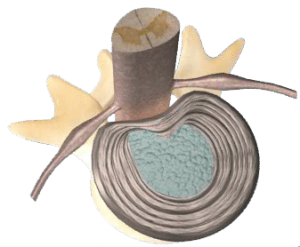 The majority of patients who present with a herniated disc do not have significant neurologic weakness, do not need surgery, and are expected to recover with nonoperative treatment. The goal of nonoperative treatment is initially to control pain, to improve physical activity, and to allow nature to intervene. Patients with significant neurologic deficit, surgery is often indicated. Anti-inflammatories, oral steroids, physical therapy, chiropractic care and occasionally epidural steroid injections into the spine are used to alleviate patient’s symptoms. 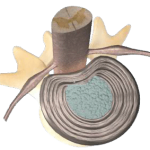 Patients improve as the body may resorb the herniated disc fragment by immunologic means as a foreign body would be resorbed in the skin such as a splinter. Surgery is reserved for patients who fail at least six weeks of nonoperative care or who have significant neurologic impairment early or those who are unable to walk, and the results of surgery for relieving patient’s radiating arm or leg pain caused by a herniated disc are quite predictable.